The global Glue Laminated Timber Or Glulam Market is anticipated to reach USD 8.0 billion by 2025, according to a new report. The global sustainability concerns along with the persistent energy crisis are among the major factors that are expected to propel market growth over the years to come. The transition from concrete- and steel-based construction to wood building materials is set to actuate demand from the market over the next eight years. Significant attributes such as high insulation, promising thermal performance, as well as high chemical resistance, are projected to influence the market positively. In addition, the advantages such as low cost and ease of construction offered by glulam relative to other building materials have made it affordable for all consumer segments. The demand for wood-based residential buildings, including single-family homes and multifamily apartments, is increasing due to their aesthetic appeal and design flexibility. Various benefits, such as improved fire resistance and durability, of the product are expected to augment market growth over the forecast period. Residential and commercial segments are expected to collectively account for around 80% of the global market revenue by 2025. The growing demand from these segments is attributed to the low cost of construction and easy maintenance of glue laminated timber. 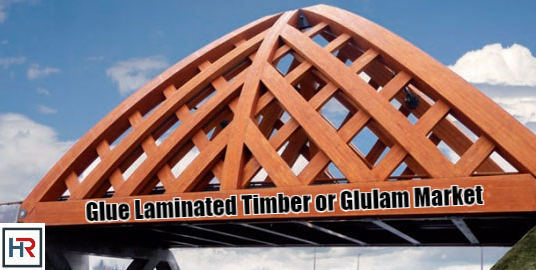 Innovations in building and design technologies are projected to boost the demand for glulam products over the forecast period. Asia Pacific is likely to emerge as the leading region owing to the growing popularity of glue laminate as a building material, along with various government regulations. Growing number of manufacturers of the product in North America and growing research & development for technological advancements are expected to propel the market. Easy availability of timber in forests of Central European countries and the presence of advanced timber processing industries are the prime factors responsible for market growth in Europe. Countries like Canada, the U.S., Italy, Japan, Australia, and China are rapidly developing markets for glue laminated timber. • The market is likely to register a CAGR of 5.9% in terms of value from 2017 to 2025 on account of growing concerns regarding environmental degradation as well as increasing awareness among consumers. The residential segment is expected to exhibit the highest CAGR from 2017 to 2025 owing to the expanding application scope in the sector for glulam due to its aesthetic appeal. • Key market players include Boise Cascade Co.; Calvert Company, Inc.; Pfeifer Holz GmbH; Setra Group AB; Canfor Corporation; Schilliger Holz AG. ; Structurlam; Mayr-Melnhof Holz Holding AG; Binderholz GmbH; B & K Structures; Eugen Decker Holzindustrie KG; and Meiken Lamwood Corp. The companies mainly focus on extensive innovation and increasing their production capacities to meet the global demand.